Bird netting is one of the most versatile solutions for bird control, providing a discreet yet effective barrier against all types of nuisance birds without inflicting harm on the birds themselves. Our nets offer you a permanent way to stop bird droppings from damaging your valuable property, providing a robust but unobtrusive defense against pest birds. Constructed with steel and extra-strong strands of polyethylene twine, the bird exclusion system creates an impenetrable barrier that denies birds the access to any architectural structure on your property. The system includes tensioned cables that are attached directly to the application site. The netting is then attached to the cable with rings, enabling a secure fit while allowing you to access the enclosed area for routine maintenance. The netting system lets you stop bird droppings virtually anywhere on your property, including ledges, eaves, canopies, warehouse internal roof spaces, roof air intake systems, roof spans, aircraft hangers etc. It’s one of the most cost-effective solutions for large open areas such as open-air ceilings and loading bays. Available in multiple mesh sizes, the netting can create a durable and long-lasting barrier against birds of any size. 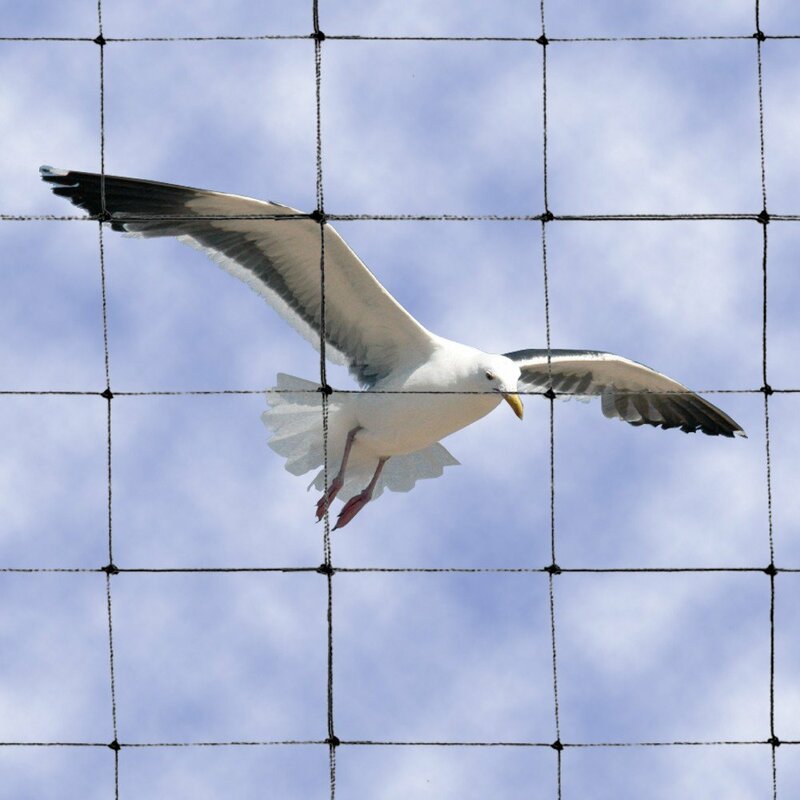 Both standard and custom netting sizes are available and come in 19mm squares for all birds and 50mm squares for Larger birds such as Pidgeon’s and Seagulls. Nets are available in standard, extra heavy duty, stainless steel reinforced for superior strength and fire retardant nets. Our Bird Netting is a Long-Lasting, 100% Solution. All of our nets are manufactured using the most advanced technology in the world, and has been developed to withstand a wide range of environmental conditions. Polyethylene is the most ultra-violet (U.V) resistant netting material available and have an extra U.V. stabilizers added in its raw materials, creating a net that will last for 10 years or more. At A Class Bird Control, our mission is to provide you with the very best solution to prevent pest bird damage effectively and humanely.